Over the weekend, former San Antonio Mayor and Secretary of Housing and Urban Development Julian Castro announced that he is running for president, and he made clear from the very start that his campaign would be defined by environmental extremism. “We’re gonna say no to subsidizing big oil and say yes to passing a Green New Deal,” said Castro, who also endorsed rejoining the Paris Climate agreement. Julian Castro isn’t mincing his words. He’s clearly hoping that by endorsing the extremist elements of the environmental movement, he can rally the left behind him and regain some of the celebrity status that he has lost over the years. He’s co-opting the language and agenda of Alexandria Ocasio-Cortez, perhaps in the hopes that she would endorse a young liberal like him. But he’s going even further to the left. In a sit-down interview with ABC’s George Stephanopoulos, Julian Castro “went even further than” Ocasio-Cortez, toying with the idea of a 90 percent income tax rate – higher than the 70 percent rate floated by Ocasio-Cortez. “As you know, George, there was a time in this country where the top marginal tax rate was over 90 percent,” said Castro. Alexandria Ocasio-Cortez was elated to hear the news of Julian Castro’s pivot to the left, with the New York Times reporting that she was “glowing” about it. 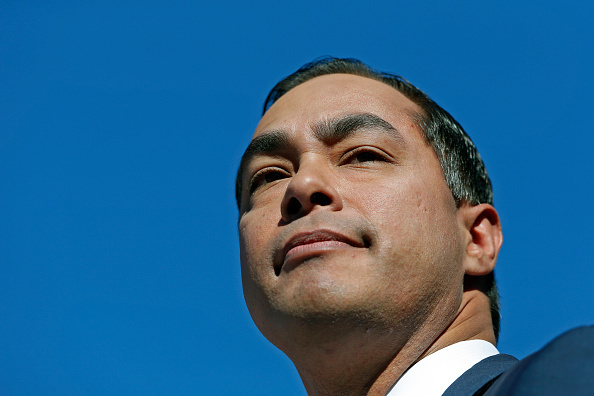 But is Julian Castro’s actual record so ideologically pure? His rhetoric doesn’t match his record. As a Texas Mayor, Castro promoted oil drilling. Castro supported the use of fossil fuels as part of America’s energy portfolio. Seems his Texas oil and gas record doesn’t match his rhetoric. Extreme environmental and tax policies are quickly becoming the norm of the left, despite them being unrealistic and unaffordable. We need a facts-based conversation, not more slogans and far-left politicians trying to outdo one another.